You mean to tell me that you can’t get your 5th and 6th grade basketball team to run the offense? What’s a matter with you? You should turn in your whistle! I have had this conversation many times with youth basketball coaches who cling to the idea that they have to have their kids run an offense. The intention is great but the reality of these kids running a set offensive pattern is pretty unrealistic. The very advanced players and upper level kids maybe, but not the average or even the above average kids. Coaches, don’t lose hair and sleep over this. The kids at this age and level are not equipped for this advanced style of play yet. 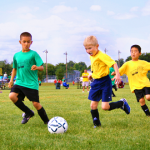 They still need to work on the fundamentals of the game and a game strategy that correlates with their age, skill level and mental development. What happens with too many coaches is that the goal and the focus is placed on running the offense rather than letting the kids develop their skills. So, the skill advancement takes a back seat to running the offense correctly. Too many valuable hours of skill development and age appropriate game skills are taken over by hours and hours of practicing the offense. There are some less strategic and more elementary offenses that can be used instead of the college level offenses. 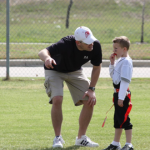 Teaching the kids the different positions and spacing and where to go after a pass is made and how to read the defense to determine your next move is more helpful at this age. The other downside of running set plays is that the kids become “robotic” in their movement. They always go to a certain place on the floor or they always pass to a certain place. They lose the sense to “read” and react, which is very important in their game knowledge and strategy. This is a detriment in developing what is called “court sense”. They need the opportunity (within your guidelines of basic positions, spacing, priorities, passing and dribbling) to try and experiment with different moves, shots and passes as they respond to the defense. Learning will take place both by making mistakes and from achieving successful moves. Take a deep breath, return that “How to Run a Successful Basketball Offense” book to the library; take that burden off your shoulders, and replace it with your whistle! Then since you won’t have to go to the “I can’t get them to run the offense” meeting tonight, you can take your wife out on a date! Have fun!! !